In an article last month, I explained how to get access to Steelroads*, the single portal that gives you visibility of all your freight rail shipments anywhere in North America. This article will give you some tips on how to best use Steelroads to your advantage. Before I get into the tips, let’s review the basic usage. If you already know how to perform a basic equipment trace in Steelroads, skip this section. After logging in to Steelroads, click on the Track and Trace link or select Track and Trace from the Application drop down list box. Once you are in, paste or enter a list of railcars (see Tip 1 below for the different ways you can enter railcars) and choose the options for the format (see Tip 2 for a more detailed discussion), load / empty filter, event filter, response option (see Tip 3 for more information), and up to 3 sorts. Click the Run button to see the trace results immediatly or click the Save Trace button to save the equipment list and trace settings for later use. Although it is not stated in the application and no error will be raised if you have more, you are limited to 1,000 equipment IDs for each equipment trace that is either saved or ran ad hoc. You can use a wildcard to include all railcars with a certain mark such as ABCX* or a certain number range such as ABCX1000-1300. The default format is Text Format – Event Translation. This is the most user friendly format because it displays the full spelling of the station cities (current location and destination) and a full description of the event; however, the Text Format does not provide an estimated time of arrival (ETA). In order to display an ETA in your trace results, you must choose either the H or the I format. Both formats are a bit less user friendly, but the H is the less unfriendly of the two; it shows abbreviated city names for the current location and destination. The I format shows the SPLC (standard point location code) for the location city and destination. This 9 digit code would be difficult to decipher without a station listing. The event code for the H and I formats is a single character. Click this link for a description of each code. NOTE: The majority of the ETAs provided by Steelroads will be to Actual Placement of the railcar at the customer destination listed on the waybill. This is an advantage over getting CLM data directly from railroads, which will provide ETAs to interchange point if that is the furthest that railroad takes the shipment. The default Response Option (option buttons labeled “5 Response Option”) for each trace is the Last Event option, which will return the latest reported sighting event for each railcar you pasted or entered in the textbox labeled “1 Enter Car Numbers…”. If you select the New Events option, the trace results will display all reported sighting events since the last time you ran the trace up to 4 days. If you have never run the trace, it will show the last 4 days of reported sighting events for each railcar pasted or entered in textbox “1”. This is a powerful option because you now have a way to capture essentially all reported events for each shipment. You can use this data to do more advanced things such as dispute railroad demurrage bills or calculate transit time. Most Steelroads accounts will have a usage cap or limit on how many reported sighting event records you can retrieve in a 1 week period. I would recommend asking your railroad sponsor to give you this number before you use Steelroads. On average, I have seen railcars generate 60 to 100 sightings per shipment. Based on that, you can approximate how many sighting events you will need. If the sponsor doesn’t provide you enough and you do a lot of business with them, contact them and encourage them to increase the amount to at least 100 sightings per shipment. As I stated in the previous section about the New Events option, you can do much more with the data if it is complete and shows every sighting event for each shipment. Related: For more information about the usage cap and recommendations on how to avoid exceeding it, read Usage Cap Established For Steelroads Users. You can schedule equipment traces to run daily, weekly or monthly. 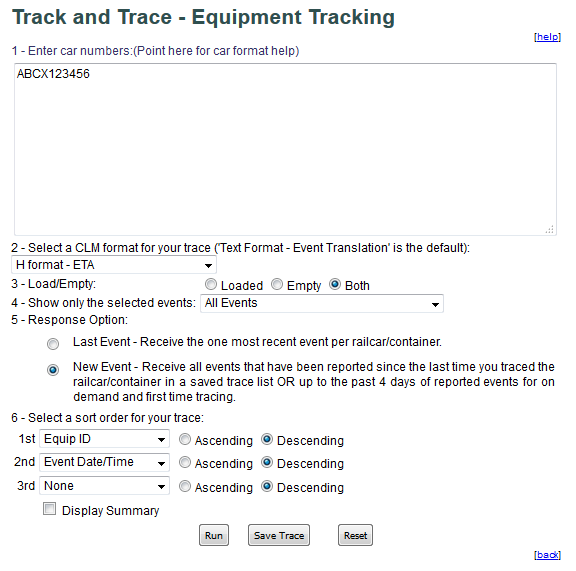 Once you have saved your equipment trace, click on the Equipment Tracking > Trace List (Paged) link. You will then see the Schedule link in the far right column. For the daily option, you can choose multiple times per day up to every 1 hour. I would not recommend once per hour as this will exceed your usage cap very quickly. Reports may be delivered to your email and up to 3 others or to an FTP account. The FTP account must be set up by Steelroads customer support – send the account information to csc@railinc.com along with your Steelroads user ID. To get instructions on how to implement this service, email csc@railinc.com and request the Steelroads Web Services User Guide. I hope that you have found this article helpful. If you have any questions or experiences that would benefit other readers, please share! Happy Holidays to you all.